A mystery series in a museum whose academic backdrop sure looks familiar. Mystery writer Alfred Alcorn at the Harvard Museum of Natural History, where he’s never had to solve a homicide. Cannibalism, lethally potent aphrodisiacs, the embalming and display of a major financial donor--not routine agenda items at academic meetings. Yet such subjects get discussed, amid hilarious persiflage, by the Oversight Committee that monitors the fictional Museum of Man (MOM), loosely affiliated with the equally fictional Wainscott University in the coastal town of Seaboard, Maine. It’s a distinguished old museum, founded by nineteenth-century seafarers who brought back, from all parts of the globe, marvelous specimens of human creation. The damnable problem is that people keep getting murdered there. So old-school museum administrator Norman de Ratour again and again finds himself a reluctant sleuth, tracking perpetrators via video surveillance cameras in Neanderthal exhibits, through anonymous e-mails from a staffer who signs messages “Worried,” and in the Primate Pavilion, where demented zoologists investigate the ability of chimpanzees to create literary works on keyboards. The three volumes in the MOM series (all from Zoland Books; a fourth is in the works) began with Murder in the Museum of Man  (1997), followed by The Love Potion Murders in the Museum of Man  (2009) and The Counterfeit Murder in the Museum of Man  (2010). 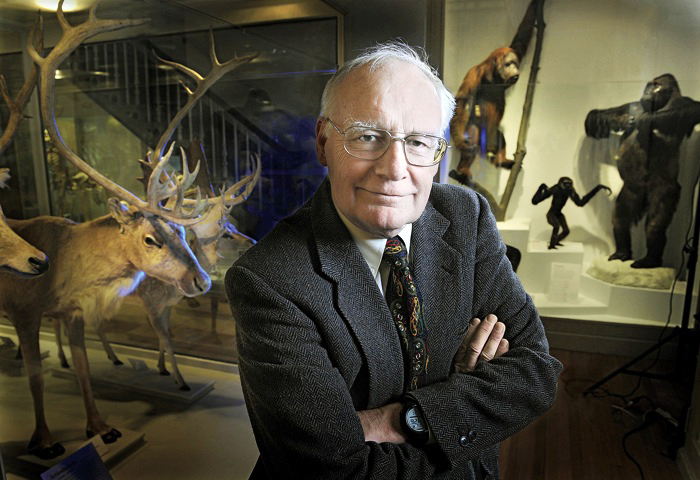 Their author, Alfred Alcorn ’64 (http://alfredalcorn.com ), edited the Harvard University Gazette from 1979 to 1986 and directed the Harvard Museum of Natural History’s travel program from 1995 until 1998 (he still leads trips on occasion). Alcorn knows both Harvard and museums well (“I have a real affection for museums,” he says. “I’ve never been in a museum I didn’t like.”). He also extracts professional knowledge from his daughter, Sarah Alcorn ’90, a private investigator. Harvard cognoscenti will readily detect the roman-à-clef aspects in his stories. A priest with a penchant for evolutionary biology, Father S.J. O’Gould, S.J., is, Alcorn says, a “caricature by inversion” of the late Agassiz professor of zoology, Stephen Jay Gould. The model for Wainscott’s African-American chaplain, Reverend Alfie Lopes, can only be Plummer professor of Christian morals Peter Gomes, minister in the Memorial Church. And the “ubiquitous lawyer” Ariel Dearth, the “Leona von Beaut Professor of Situational Ethics and Litigation Development” at Wainscott’s law school, may remind some of another attorney who shares his initials, Frankfurter professor of law Alan Dershowitz. The plots, even for whodunits, are as unconventional as the academic setting. Pharmacological researchers invent an aphrodisiac so powerful that villains turn it to homicidal ends; its menace surfaces upon the discovery that two faculty colleagues, united only by mutual loathing, have perished via fatal copulation. A cultish fellowship of anthropologists becomes so immersed in their study of cannibalism as to actually practice it: in reporting on the remains of the murdered Dean Fessing, the coroner, de Ratour declares, "took unseemly relish, I thought, in relating to me some of the details of the autopsy. Indeed he sounded more like Rick Royick, the Bugle’s food critic, than a coroner. The dean’s buttocks, it appears, were baked with a cinnamon honey glaze…medallions of thigh dressed in a basil curry beurre blanc that had been served with a thyme-infused purée of white beans and black olives in a marinade of citrus and fennel.…I must say that if the doctor was indulging in levity at my expense, it is a levity I find in the worst possible taste, and no pun is intended." In the third book, a chimpanzee named Alphus, benefiting from a surgically enhanced cranial blood supply, develops full command of sign language, a taste for single-malt Scotch, and an ability to write English prose that might rival Gibbon. Alcorn, too, has great fun with names. A young and beautiful tart who makes the unlikely career transition from call girl to lab assistant is Celeste Tangent; she had worked for the “Russian-Jewish mob in Brooklyn,” one of whose rulers is Victor “Dead Meat” Karnivorsky. The Seaboard police department’s Lieutenant Tracy collaborates with de Ratour in solving the homicides. (The author rarely mentions the lieutenant’s first name, which is, of course, Richard.) And in the third book, three possible murder suspects are Feidhlimidh de Buitliér, curator of the Greco-Roman collection, Merissa Bonne, widow of the decedent, and Max Shofar, a rare coin dealer--whose surnames send up the classic mystery lineup of servants: butler, maid (bonne is French for maid), and chauffeur. Codes are embedded everywhere. Norman’s full name, for example, is Norman Abbott de Ratour--eliding the de yields N.A. Ratour, or narrator.